We’ll provide some insights and review some of our DFS value players for week 2. Case Keenum (DEN) – Salaries: DraftKings (DK) – 5800, FanDuel (FD) – 6700. Keenum’s upcoming salary ranks him 18th/23rd on DK/FD, respectively for the position. Keenum posted a 25/39, 329, 3:3 line against Seattle last week. Keenum’s fantasy points of 25.16/22.16 ranked him 5th/9th on DK/FD, respectively. Keenum’s price per point efficiency ranked him 4th/7th on DK/FD, respectively. Keenum’s yards per attempt of 8.4 ranked him 9th. Denver ranked 7th in offensive plays with 72 in week 1. Keenum’s aggressive % of 28.2 per NFL next gen stats, ranked him #1 last week. Aggressiveness is defined as pass attempts with a defender within 1 yard of the intended target. The betting lines with the Raiders has the game total at 45.5 points with the Broncos as -5.5 point home favorites. The Broncos’ implied team total is currently at 25.5 points and the Raiders are currently at 20 points. The Raiders’ defense ranked 27th in DVOA against the pass in week 1. Jared Goff put up a 18/33, 233, 2:0 line at Oakland last week. Keenum nearly hit 5X value last week, and with a great home matchup against a weak Raiders defense, he has another clear path to outperform his salary. Tyrod Taylor (CLE) – Salaries: DraftKings (DK) – 5900, FanDuel (FD) – 6600. Taylor’s upcoming salary ranks him 17th/24th on DK/FD, respectively for the position. In his first start for his new team, Tyrod posted a line of 15/40, 197, 1:1, and 8-77-1 on the ground against the Steelers last week. Taylor’s fantasy points of 24.58 ranked him 7th/6th on DK/FD, respectively. Taylor’s price per point efficiency ranked him 6th/5th on DK/FD, respectively. The betting lines with the Saints has the game total at 49.5 points (2nd highest on the board) with the Browns as +8.5 point road dogs. The Browns’ implied team total is currently at 20.5 points and the Saints are currently at 29 points. Ryan Fitzpatrick put up a 21/28, 417, 4:0 line and 12-36-1 on the ground at New Orleans which made him the #1 fantasy QB last week. Tyrod will not face the adversity of rain and wind like he did last week in Cleveland, and the implied negative game-script should force his hand in this potential shootout. Alex Smith (WAS) – Salaries: DraftKings (DK) – 6000, FanDuel (FD) – 7100. Smith’s upcoming salary ranks him 14th/17th on DK/FD, respectively for the position. Smith posted a 21/30, 255, 2:0 line and 8-14-0 on the ground at Arizona last week. Smith’s fantasy points of 19.6 ranked him 13th on both DK/FD. Smith’s price per point efficiency ranked him 10th/9th on DK/FD, respectively. Smith’s yards per attempt of 8.5 and his fantasy points per attempt of .65 both ranked him 8th for the position. For a comparative take to other QBs, these stats can be found at this QB stats page. The betting lines with the Colts has the game total at 45.5 points with Washington as -5.5 point home favorites. Washington’s implied team total is currently at 25.5 points and the Colts are currently at 20 points. Andy Dalton put up a 21/28, 243, 2:1 line and 2-8-0 on the ground at Indianapolis last week. Washington ranked 4th in offensive plays with 75 in week 1. Smith will have a much better matchup this week at home and shouldn’t have any issues at least hitting value and outperforming his salary. Adrian Peterson (WAS) – Salaries: DraftKings (DK) – 5500, FanDuel (FD) – 6700. Peterson’s upcoming salary ranks him 23rd/18th on DK/FD, respectively. Peterson posted a 26-96-1 line and 2-70-0 on 3 targets with a lost fumble at Arizona last week. Peterson’s fantasy points of 23.6/21.6 ranked him 9th/8th on DK/FD, respectively for the position. Peterson’s price per point efficiency ranked him 8th/6th on DK/FD, respectively. Peterson’s 28 touches ranked 2nd for all RBs in week 1. Peterson also led all RBs in red zone rush attempts with 7 in week 1. The Bengals’ RBs combined for an 18-93-1 line and 6-65-0 on 8 targets at Indianapolis last week. Peterson gets a solid matchup at home with an implied positive game-script. He’s in play as cheaper option with a solid floor while he still has some juice in his legs. Jordan Howard (CHI) – Salaries: DraftKings (DK) – 5900, FanDuel (FD) – 7400. Howard’s upcoming salary ranks him 16th/10th on DK/FD, respectively. Howard posted a 15-82-0 line and 5-25-0 on 5 targets at Green Bay last week. Howard’s receiving line led all Chicago RBs, indicating that he has taken over the 3rd down role over Tarik Cohen. Howard’s 20 touches ranked 10th for RBs in week 1. The betting lines with the Seahawks has the game total at 43.5 points with the Bears as -3 point home favorites on Monday night. The Bears’ implied team total is currently at 23.25 points and the Seahawks are currently at 20.25 points. The Broncos’ RBs combined for a 32-146-0 line and 4-42-1 on 5 targets against the Seahawks last week. Howard’s usage indicates a true workhorse role and is setup for a solid matchup with a positive game-script. Randall Cobb (GB) – Salaries: DraftKings (DK) – 4600, FanDuel (FD) – 6200. Cobb’s upcoming salary ranks him 49th/38th on DK/FD, respectively for the position. Cobb posted a 9-142-1 line on 10 targets (all team highs) against Chicago last week. Cobb’s fantasy points of 32.2/24.5 ranked him 5th/4th on DK/FD for the position. Cobb’s price per point efficiency ranked him 3rd/4th on DK/FD, respectively. The betting lines for this game in Green Bay are currently off the board as QB Aaron Rodger’s status (knee) is currently unknown. This play is contingent on Rodgers playing first off. But assuming Rodgers is a go, his left knee will be an issue, affecting his mobility, which will also affect his ability to buy time and stretch plays. Last week upon returning to the game, Rodgers was not able to plant the left leg, affecting his power and deep ball opportunities. This is where Cobb should step in. Cobb ran all his routes exclusively from the slot last week. His target share of 27% led the team last week, and this percentage could increase. Rodgers will need to get rid of the ball quickly and often, just to survive this game. Cobb should be the recipient of the majority of the anticipated dink-and-dump targets. If Rodgers is out, Dalvin Cook makes for a strong play. 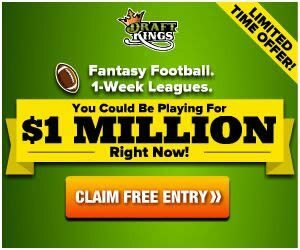 Chris Godwin (TB) – Salaries: DraftKings (DK) – 4600, FanDuel (FD) – 6100. Godwin’s upcoming salary ranks him 49th/40th on DK/FD, respectively for the position. Godwin posted a 3-41-1 line on 4 targets at New Orleans last week. Godwin’s fantasy points of 13.1/11.6 ranked him 40th/35th on DK/FD for the position. The betting lines with the Eagles has the game total at 44 points with the Bucs as +3 point home dogs. The Bucs’ implied team total is currently at 20.5 points and the Eagles are currently at 20.5 points. This play is contingent on DeSean Jackson (concussion/shoulder) missing week 2. D-Jax is still in the protocol and his status is trending towards doubtful. Godwin would assume WR2 duties. Considering the Bucs have a snowballs chance in Arizona to effectively run the ball against this Eagles defense, Godwin should be the #2 best offensive option in an implied negative script. D-Jax put in a full practice on Friday and is expected to play, which ultimately deflates Godwin’s value. Devin Funchess (CAR) and Quincy Enunwa (NYJ) are both solid options around this price-point this week. Tyler Lockett (SEA) – Salaries: DraftKings (DK) – 4800, FanDuel (FD) – 5600. Lockett’s upcoming salary ranks him 42nd/58th on DK/FD, respectively for the position. Lockett posted a 3-59-1 line on 4 targets at Denver last week. Lockett’s fantasy points of 14.9/13.4 ranked him 27th/24th on DK/FD for the position. The betting lines with the Bears has the game total at 43.5 points with the Seahawks as +3 point road dogs on Monday night. The Seahawks’ implied team total is currently at 20.25 points and the Bears are currently at 23.25 points. WR1 Doug Baldwin (knee) will be out for a few weeks, leaving Lockett as the interim WR1 on a thin receiving corps. Lockett ran 75% of his routes from the slot last week and will take over Baldwin’s role. Lockett was also clocked as Seattle’s fastest skill weapon at 20.35 mph last week. Barring further blow up plays from blocking end Will Dissly, Lockett’s market share of volume should spike at a discounted price. 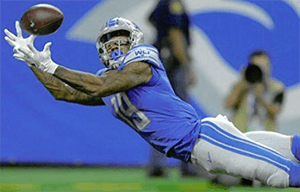 Kenny Golladay (DET) – Salaries: DraftKings (DK) – 4800, FanDuel (FD) – 5700. Golladay’s upcoming salary ranks him 42nd/53rd on DK/FD, respectively for the position. Golladay posted a 7-114-0 line on 12 targets. His catches, yards, and snaps ranked first and his targets ranked second for receivers on the team last week against the Jets. Golladay’s fantasy points of 14.9/13.4 ranked him 27th/24th on DK/FD for the position. Golladay’s price per point efficiency ranked him 11th/18th on DK/FD, respectively. The betting lines with the 49ers has the game total at 48 points with the Lions as +6 point road dogs. The Lions’ implied team total is currently at 21 points and the 49ers are currently at 27 points. BabyTron mostly runs out of the “Z” which should align him across from Richard Sherman when this occurs. At 6’4″, 218 lbs, and having been clocked as Detroit’s fastest skill weapon at 19.15 mph last week, he should pose a nightmare matchup for Sherman. With an implied negative script and Detroit’s continued inability to run effectively, BabyTron has a solid path to outperform his salary. Benjamin Watson (NO) – Salaries: DraftKings (DK) – 3400, FanDuel (FD) – 5100. Watson’s upcoming salary ranks him 16th/18th on DK/FD, respectively for the position. Watson posted a 4-44-0 line on 4 targets against Tampa Bay last week. Watson’s fantasy points of 8.4/6.4 ranked him 11th/12th on DK/FD for the position. Watson’s price per point efficiency ranked him 10th/9th on DK/FD, respectively. Watson had a full complement of snaps last week as his 51 ranked third on the team behind only Michael Thomas and Alvin Kamara. Watson also pulled in his lone red zone target. The betting lines with the Browns has the game total at 49.5 points (2nd highest on the board) with the Saints as -8.5 point home favorites. The Saints’ implied team total is currently at 29 points and the Browns are currently at 20.5 points. Jesse James posted a 3-60-0 line on 5 targets at Cleveland last week. Overall, the Saints offense should eat and Watson does have a path of opportunity and comes at a cheap price. Jared Cook (OAK) – Salaries: DraftKings (DK) – 3600, FanDuel (FD) – 5000. Cook’s upcoming salary ranks him 13th/19th on DK/FD, respectively for the position. Cook posted a 9-180-0 line on 12 targets (all team highs) against the Rams last week. Cook’s fantasy points of 30/22.5 ranked him 1st on both DK/FD for the position. Cook’s price per point efficiency ranked him 2nd on both DK/FD, respectively. The betting lines with the Broncos has the game total at 46 points with the Raiders as +6 point road dogs. The Raiders’ implied team total is currently at 20 points and the Broncos are currently at 26 points. Seattle TEs combined for a 4-116-1 line on 7 targets at Denver last week. Cook’s single game yardage last week is a Raiders record. Cook now owns this record for three different franchises. Cook was also clocked as the Raiders’ fastest ball carrier at 19.23 mph last week. Cook’s team target share of 30.8 ranked 2nd for TEs last week, behind only Zach Ertz. The matchup is a solid one for Cook and if the current Carr/Gruden “game plan” even remotely holds, Cook could emerge as Oakland’s top receiving option at least early into the season.